20" scale length, mahogany body, rosewood fretboard, tortoiseshell binding front and back around edges of body. 'Made in USA' below Martin logo inside instrument on centre back strip. 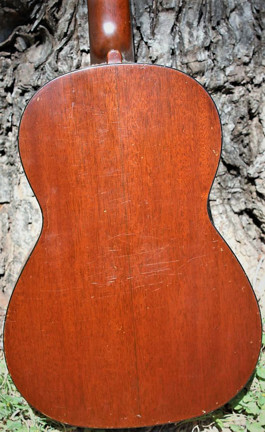 This instrument is in 'good' to 'very good' condition with only one notable blemish: an area on the front of the body where the finish is worn/scuffed over an area about ½" by 1"caused by strumming. Otherwise it has the normal small dings of a well played vintage instrument, but no major flaws. This model was made from 1960 to about 1980. 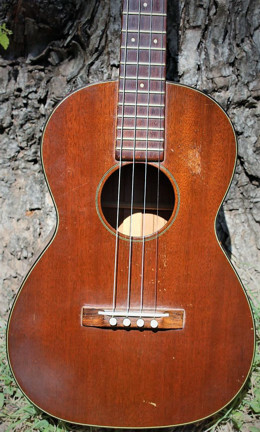 The "Made in USA" was added in 1962 and the binding changed from tortoise shell to black in 1966, so this instrument dates to between 1962 and 1966. It plays very nicely with a classic rich Martin sound and good intonation. The fretboard, frets, and action are in good condition. Comes with a new hardshell case. Buyer to collect or pay shipping from Austin, Texas (USA).